One of the things that makes food in this city so fabulous is the abundance of lovingly raised, local produce. I’m just back from Marché Jean-Talon (between Jean-Talon and De Castelnau metro stations). This is probably one of those occasions where pictures speak louder than words. Yes, that’s me. I look even more cheerful than that now, because I’m gorging myself on strawberries from the first picture. The French (and, doubtless, the French Canadians) have a term for the thing that happens to your body after a meal like this – it’s a crise de foie, or a liver crisis. My own liver is palpitating and throbbing, has likely become hardened and greenish in parts and feels as if it’s doing its job about as competently as Gordon Brown, but this is a small price to pay for a sublime meal. Even if it’s a sublime meal that makes you have to go and lie very still in a darkened room afterwards. Au Pied de Cochon (536 Duluth Est, Montreal, 514-281-1114) is run by foie gras and fat genius Martin Picard. It’s a Montreal institution, always heaving with diners (who are, strangely, quite thin for the most part) – you’ll have to book, and book well in advance. This is a menu where you’ll find foie gras in almost every dish; where offal and fat are treated with something between respect and worship. We opened with the home-brewed beer and starters which we thought we had cunningly selected to avoid too much richness before the main course. After all – salads and soups are the thinking person’s way to ensure there’s room left for pudding, aren’t they? Dr W’s French Onion Soup was based around a darkly glossy, rich and meaty stock, and came in a bowl large enough to drown a small family in, topped with a battleship-sinking amount of cheese. It was also extremely good, so he drank it all with little thought for saving room for what came next. My own Crispy Pied de Cochon Salad (see the picture at the top of the page) was only a salad in the very loosest sense – fatsome, hot nuggets of pork nestled with walnuts in a salad full of fried onions, roast tomatoes and steaming meat juices, any green leaves wilting gorgeously against the warm ingredients. On top was balanced a deep-fried, breaded square about half the size of a fat paperback book, sprinkled with some fleur du sel. Poked with a fork, it leaked an intensely porky, gelatinous mash of pork hock, made liquid by the heat of the frying. Something in that pork went straight to the self-control centres of my brain and prevented me from stopping eating before the plate was nearly clean. Starters over, we looked at each other in panic. There was clearly no way in hell we were going to be able to manage our main courses. Something untranslatable called a Plogue à Champlain arrived for Dr W. It’s a pancake. And a thick slice of home-cured bacon. And some crispy potatoes. And a layer of melted cheddar cheese. And a lobe of foie gras. And a ladleful of a rich, sweet duck and maple syrup sauce. I realise that this sounds like a total abomination. God knows how Picard came up with it – and it doesn’t make the slightest sense on paper – cheddar and foie gras? Nonsense. But once this stuff is in your mouth, you’ll see exactly why this man is a fruitcakey, cheese-sodden genius. Utterly amazing, completely delicious and approximately 240% bad for you. Between moans of pain from a rapidly distending stomach and imprecations to various deities, Dr W cleaned his plate. I’d ordered the Duck in a Can. A plate arrived, bearing a large slice of toasted sourdough bread covered with a thick layer of celeriac purée. Next, a waiter with a large, hot can and a tin opener came to the table, unzipped the top of the can and poured the contents over the slice of sourdough with a fabulously meaty schloomping noise. A fat magret de canard, yet more foie gras, some whole garlic cloves and unctuously buttered cabbage, dotted with bits of preserved pork sausage, slipped out in a balsamic glaze – the meat and vegetables aren’t preserved in the can, merely cooked in there in a sort of weird sous vide style. (Something of a shame, in that this means you won’t be able to buy your own can to take home.) Meat touching the bottom of the can had caramelised into a sticky, heavenly layer of goodness – and I have no idea how cabbage can come to taste so good. This thing was absolutely enormous. Even if I hadn’t consumed nearly my own weight in fatty pork only ten minutes earlier, it’s unlikely I could have made much headway into the dish – as it was, for the first time in my life I found myself eating around a foie gras, because all this richness was becoming simply unbearable. My god, though, the aroma coming off this dish was incredible. So much so, that people at the next table turned, asked what it was and immediately ordered one each. We staggered back to the hotel. Slowly. We lay down. We have nearly recovered. We’re going back again on Friday evening. Every life has a few golden moments. I had one today, when I realised I’d eaten two of the best sandwiches in my life in the space of 24 hours. First stop – Schwartz’s Charcuterie Hebraique (3895 Boul. St Laurent), where you’ll find great heaps of something called smoked meat, sliced thin and piled on white bread spread with mustard, accompanied by a slightly obscene-looking pickle, some crisp, fresh French fries, and a can of cherry cola. 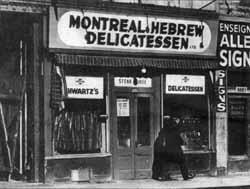 Smoked meat is a Montreal speciality, somewhere between pastrami and a barbecued brisket (but still entirely unlike either), and Schwartz’s is where you’ll find the city’s finest – they’ve been at it since 1928, and are still in the original location. There’s always a queue snaking out of the door. This is not a restaurant you’ll be visiting for the decor, which reminded me of the dilapidated fish and chip shops I used to visit with my Grandma at the end of the 1970s back in England, all Formica tables and framed, yellowing newspaper cuttings. You’re here for the exceptional sandwiches and the meat, smoked daily and piled high in the window. I’d been warned about unfriendly service, but we found that the staff were actually exceptionally helpful and friendly – try to sit at the bar, like we did, so you can watch the meat being prepared. Ask for your sandwich to come medium or fatty (a lean cut will carry less flavour), chomp down on your pickle to cut through the grease, and make sure that you order a cherry cola, which somehow happens to be the perfect liquid accompaniment for one of these fabulous sandwiches. One world-beating sandwich joint isn’t enough for Boulevard St Laurent. Head for Chinatown, and about twenty yards from the pagoda gates you’ll find Cao Thang (1082 Boul. St Laurent – this is the same street you’ll find Schwartz’s on, but it’s a brisk walk of about ten minutes between the two). Cao Thang is a tiny shop – really a counter and a fridge – selling Banh Mi, a baguette stuffed with a gorgeous Vietnamese concoction of roast pork and pork sausage with lightly pickled carrots and daikon, a generous sprinkling of coriander and chillies, all sauced with a garlicky, savoury mixture that smells like heaven by way of Saigon. It’s only open for lunch, and there are no seats – we found ourselves sitting on cinderblocks in a carpark across the road and being shouted at by tramps, but so good was my mood once I had chunks of this transcendental (and absurdly cheap) sandwich in my mouth, they might as well have been singing light opera. This is looking like a great week for food. I’m starting to like this city very, very much. Finally – a foodie oasis in Cambridge’s wasteland of chain pizza restaurants and noodle bars. 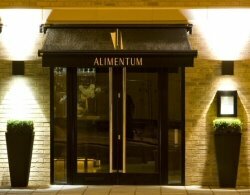 Alimentum, which has just received three well-deserved AA rosettes, fills me with a sense that perhaps things in this town aren’t really so bad after all; here, at last, is a restaurant which pays the attention to detail you really want to see in a fine-dining joint. A few factors make Cambridge a disaster for those looking for a good meal. Almost all the commercial property is owned by the colleges, who keep rents high – as a result, chain restaurants are the most likely to find pitches in the city viable. We’ve got a very fluid population, with students appearing and then disappearing for half the year, and tourists filling the town to bursting point in summer, then buggering off again. The size and employment clout of the university means that most of those applying for work in restaurant kitchens often come with experience of working in a college buttery and nothing else – worlds away from the magic going on in kitchens like that at Alimentum. 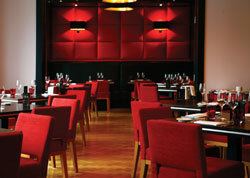 I very seldom eat in the city – London is only 45 minutes away, and there I can find the sort of restaurants I like. Alimentum has turned things on their head – Londoners are coming to Cambridge for supper, because Alimentum is only 45 minutes from King’s Cross. The restaurant is run with a strict ethical ethos. This means local, ethically raised meats from farms which are visited by the restaurant owner. Used oil which is collected and turned into biodiesel; dishwasher water which is recycled and used for heating. There’s a Crustastun unit in the kitchen which is used to humanely kill crabs and lobsters, and even the furniture in the beautiful deco dining room is ethically sourced. All this and fantastic food – it’s glorious to be able to indulge yourself and save the world all at once, as you sip your cocktail through a biodegradable straw. I started with some crisp-skinned, honeyed quail, served off the bone with a savoury little breaded croquette of risotto. 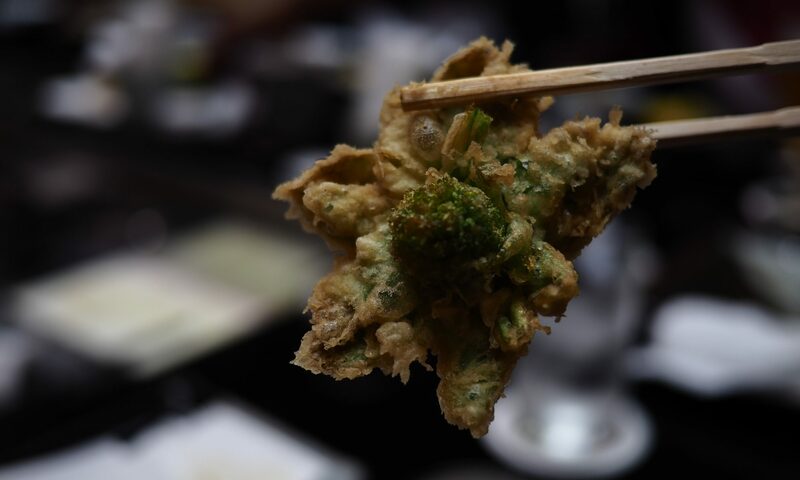 Every preparation on the menu is intricate, but showcases each main ingredient – a main course of beef used the brisket, cooked until gelatinous then shredded, pressed, breaded and fried until golden. The fillet, cooked to a juicy medium-rare with a savoury crust, was cut into thick slices and perched on top, everything bathed in an unctuous demi-glace. This is good, good stuff, deeply beefy and gorgeous on the plate and on the tongue. Dessert was a jelly made from local strawberries. Not too sweet, and intensely fragrant, it arrived in a pyramid, each side tiled with a sliver of Valrhona chocolate, drizzled with an intense 30-year-old balsmic vinegar. If pudding could sing, this would have been belting out Mozart operettas. There’s also a great (and wonderfully stinky) cheeseboard, which the charming waiting staff will talk you through. This was a tough menu to choose from; everything sounded tempting, and every diner at my table had a plate I just had to pinch something from. The restaurant’s signature slow-cooked belly pork with pig parts was heartbreakingly, stickily, cracklingly good. The wine list (which, along with the frequently changing menu, is available on the restaurant’s website) is terrific, and the Malbec we selected was a fantastic pairing. Cocktails are also really good fun: my favourite was The Cucumber Number, with Hendrick’s gin, cucumber, raspberries and Framboise liqueur. It’s worth checking the restaurant’s website for their various special deals – if you book for the Tuesday jazz night, you might see me there. Massive apologies for the gap in posting. Something dreadful happened: Dr W bought me a copy of Spore, and my week subsequently vanished. It wasn’t just the week that disappeared – with it went my ability to sleep or get anything besides evolving, building cities, murdering pirates, searching for the Grox and colonising several star systems done. Still – I’m back now, and the really good news is that next week I will be blogging from Montreal, where I’ll eating at Toque! (apparently one of Canada’s best restaurants), Au Pied de Cochon (foie gras, duck, pigs’ feet, poutine), Schwartz’s Charcuterie Hebraique and plenty of other interesting spots, as well as hunting down some markets and delis. Spore is not coming with me to Montreal, so I’m all yours. This time, I’ve booked a suite hotel, specifically because it came with a kitchen. How many times have you been on holiday and found yourself antsy because you don’t have a fridge or oven to keep or cook that amazing and fascinating thing you found someone selling? Anyway. Onto the gingerbread. This is a southern English gingerbread, not the northern parkin, which usually includes oatmeal along with the treacle. This gingerbread is a lovely dense, moist, dark cake, which will keep perfectly for more than a week if you wrap it tightly in greaseproof paper and tinfoil. Don’t eat this on the day that you make it – wrap it up and put it to one side for a day, and your gingerbread will become even moister and stickier overnight. Grease the bowl of your weighing scales, and measure out the treacle and syrup. Pour them into a saucepan (patting yourself on the back for having had the foresight to grease the bowl) and warm gently, until the mixture reaches body heat. In another pan, dissolve the sugar in the milk over a low heat and set aside. Sieve the flour, spices and bicarb together, and rub the butter into the mixture, as if you were making pastry, until you have a fine mixture resembling breadcrumbs. Add the ginger pieces and mix thoroughly. Use a balloon whisk to beat the milk and sugar mixture, then the treacle and syrup mixture, into the flour. Finally, beat the egg into the gingerbread batter with your whisk. Pour the mixture into a greased and lined loaf tin, and bake for 1-1¼ hours, until a toothpick inserted into the middle of the gingerbread comes out clean. Cool in the tin, turn out and wrap tightly for 24 hours before eating. I’m distracted today – I’ve been waiting for the plumber to turn up for the last three hours. To pass the time, I thought I’d participate in the most recent foodie meme that’s been doing the rounds. Andrew from Very Good Taste has come up with a list of 100 foods he thinks every omnivore should eat in their lifetime. I’ve eaten everything that’s marked in bold on the list – crossed-out foods are foods I am unlikely ever to find myself putting in my mouth, and those in normal type are foods which I’ve merely somehow failed to try. So far. I’ve tried all but nine – and should have got the number down to eight by October. Update Jan 2009 – we’re down to seven! I already have a list of Montreal’s top poutine joints in my notebook, ready for deployment later this month.